This 3 part series is designed to provide attendees with a step-by-step process of conducting an investigation into an impermissible disclosure of PHI/EPHI within your company. The objective of the training is to provide attendees with tracking tools, audit logs, and provide a basic understanding in conducting a Breach Risk Assessment using a Low Probability of Compromise guidance. Each session is 60 minutes in length and are recorded, allowing unlimited views of the training. Handouts and Audit Tools are provided. Practices will be able provided a HIPAA Incident Log in Excel format. Breach Risk Assessment Analyses will be conducted. Demonstrations on accessing OCR’s Breach reporting. Can’t make the live viewing? No problem! You will receive the recording along with handouts. No need to take time out of your busy schedule. 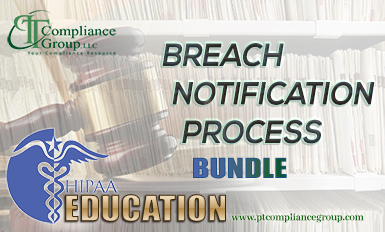 This webinar bundle is also part of our HIPAA Education Series. Purchase the series and receive a 10% discount.